The 40th anniversary of a unique ministry was celebrated on the evening of Sunday, July 29, 2012. That night, churches in the town of Dresden, Ontario, marked 40 years of “Sunday Evening In The Park.” This drive-in church service was the brainchild of Baptist minister Dann Filyer. The invention of the automobile is sometimes blamed for drawing people away from church, but some Christian ministers decided to make use of the new technology rather than fight it. Drive-in church services had sprung up in the US, but Filyer first tried out the idea when he was pastoring a church in Aurora, just north of Toronto, in the early 1960s. Using a bullhorn on top of his red station wagon, he drove around town inviting people to “Come as you are—come in your car.” The first services took place in a small strip mall along Yonge Street in the centre of town. Filyer preached from a trailer fastened to the car’s back bumper. Later, a farm stake truck with wooden racks was customized into a travelling sound stage. Typically, Filyer painted the truck fire engine red. When Filyer moved on to pastor the Baptist church in Waterford, Ontario, in 1965, that church agreed to follow a similar pattern of outreach—except that the service took place at the local baseball diamond. Most people parked their cars on the outfield grass, but some sat in the bleachers. Filyer preached from another converted farm truck parked on top of home plate. That church continued the ministry for quite a few years after Filyer left. When Filyer moved to North Dresden Baptist Church in the spring of 1972, he was anxious to continue this unique ministry. In this case, the groundwork had already been done. The previous Baptist pastor, Bert Lorimer, had been holding outdoor services in Dresden’s Jackson Park, but had used chairs from the church set out in rows—which had more of the feel of a regular church service. As well, the Baptist church had a practice of having occasional joint services with Evangel Pentecostal Tabernacle in one of the church buildings. Filyer decided to combine the two ideas. By the summer of 1972, the two churches had received permission to hold drive-in services on Sunday nights in the park. At first, the preaching was done from a farm wagon equipped with a piano and a pulpit. The format was to have a musical group present a number of songs (it was the era of the gospel quartet), and then one of the pastors would preach a short gospel message. People could sit in their cars or on lawn chairs. When Filyer moved on to Brantford, Ontario, in 1977 he acquired another farm truck and held drive-in church services in the parking lot of an auto parts store—a practice he continued until he retired in 1986. Back in Dresden, however, the service continued. Between 1988 and 1994, the Charlemont and Zion Free Methodist Churches joined with the founding congregations. The service was handed over to the Dresden and District Christian Ministerial Association in 1994. It is now run by a committee consisting of two pastors and eight laypeople, currently chaired by Paul Shaw, minister at Mount Zion Presbyterian Church. In 1998, the churches received permission to erect a permanent pavilion in the park, at a cost of $3500. People still sit in lawn chairs or in cars parked along the edge of the park. The services have been more about building long-term relationships and connecting with the community. They are a relaxed, non-threatening place where people who might feel intimidated about going into a church building can “come as they are” and hear the gospel. 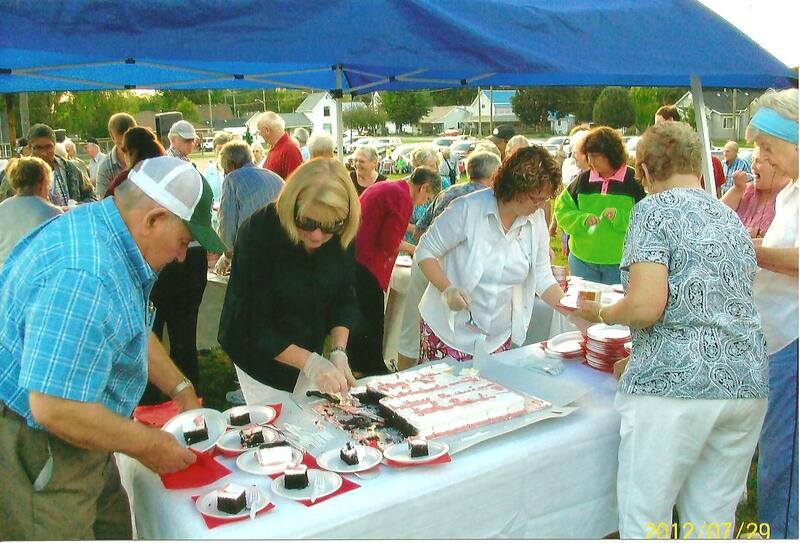 Cake was served after the July 29 service to celebrate the anniversary.